The strength of Kevlar® helps the cone retain its shape at very high energy levels and its low mass assures quick, accurate response. The cone's woven surface delivers smooth, uncolored mids. The kapton voice coil former and butyl rubber surround ensure that these woofers will provide years of consistent, reliable performance. Soft dome tweeters deliver natural, uncolored high frequency audio evenly over a wide dispersion pattern. Ferro Fluid is used in the voice coil gap to lubricate and cool it. This significantly increases power handling and improves transient response. The pivoting feature allows the already wide dispersion pattern to be aimed directly at the central seating/listening area delivering a seamless, transparent and coherent sound space. 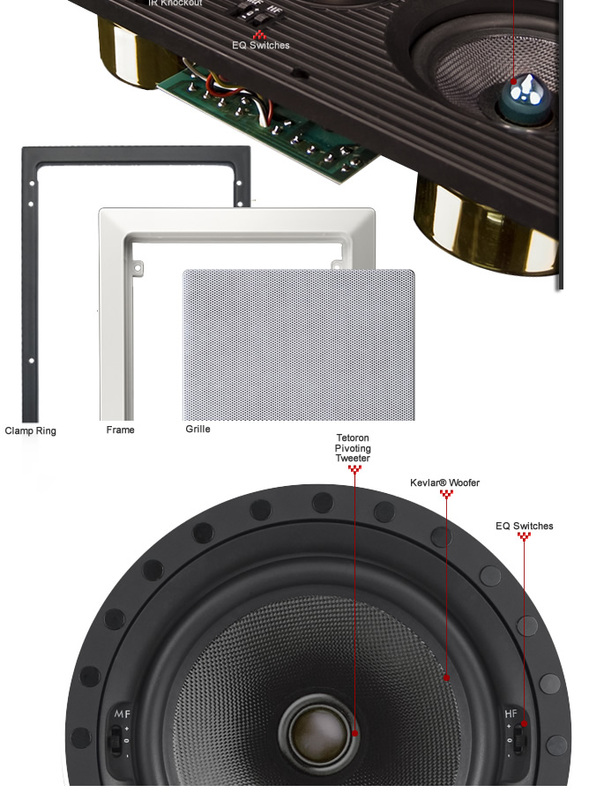 The K-602, K-802 and K-5LCR rectangular in-wall loudspeakers feature a mounting provision for a remote control signal receiver behind the loudspeaker grille. This allows discrete integration with an infrared receiver/repeater system. These systems work with your standard IR remote controls to allow command of your entire system from any equipped room in your house. Numerous factors affect loudspeaker sonic performance, such as placement and proximity to corners. Midrange and high frequency equalizer controls placed conveniently on the front of the loudspeaker baffle allow the user to adjust the high and middle frequency response of each loudspeaker to compensate for differences in environment and placement. In any conventional loudspeaker, the highest frequencies of audio emanate from the area around the center of the cone and the lower frequencies are produced by the area of the cone that is farther from the center. In fact, the distance from the center at which a sound wave will come off a loudspeaker cone is directly related to its frequency. This helps explain why larger cone loudspeakers are usually capable of producing more bass. Due to the shape of the conventional loudspeaker cone, the higher frequency sound waves tend to collide at a focal point. This causes phase distortion and a loss in clarity. As a result, accuracy and transparency suffer. This also has detrimental effects on the realism of the sound environments created by today's high fidelity digital audio and surround sound systems. The phase plug pole piece extension improves driver performance and clarity by deflecting delicate midrange audio out into the sound space and minimizing distortion producing collisions. The frames & grilles are factory finished in satin white, which will stand as a finish on its own or serve nicely as a primer base if painted to match or complement wall finish or room décor without the need for any additional preparation. Spun cellulose grille inserts provide sonic transparency yet visual opacity so the individual driver components are not visible through the grille. The Preference Accurate Imaging Baffles (AIB) utilize a ribbed design, which contribute strength and rigidity factors to the baffle, thereby simultaneously eliminating "baffle flexure" and the "early reflections" from the drivers, which smear the three-dimensional acoustic imaging of In-Wall loudspeakers. Our rectangular in-wall models utilize a clamp-ring mounting system which maximizes clamping surface. By distributing the clamping force over a larger surface area, the pressure on your sheet rock is reduced while the overall mounting strength is increased. The mounting ring comes pre-assembled to the loudspeaker frame dramatically reducing installation time.